Fritz Reiner�s lithe interpretation of Antonin Dvorák's Ninth Symphony �From the New World� still stands the test of time and remains one of the finest conducted and played accounts of this popular and over played score in the current catalogue. Played on my NAD CD player through a NAD amplifier with BOSE speakers, I found this RCA �Living Stereo� Super Audio CD reissue sounded flat, etiolated and lack lustre when compared to the original 1995 BMG Classics CD issue (CD: 09026-62587-2) which had far greater body, dynamic range and depth. However, people hear things differently and some may prefer a more smooth, superficially shiny and homogenised sound that the SACD offers. This SACD may sound better when played on a SACD player. Reiner�s incisively cut, flawless diamond Dvorák's �New World� is a paradigm performance that always remains astonishingly fresh and shining even after repeated listening. The Allegro molto is broadly measured with perfectly etched and pointed timpani and brass whilst the Largo is beautifully phrased and played but without ever sounding sentimental or sluggishly slow as can be the case with lesser conductors; the cor anglais solo was poignantly is exquisitely played. The Scherzo has an appropriate rawness of texture yet without sounding congested and heavy with CSO horns, timpani and triangle having a cutting edge with Reiner coaxing buoyant rhythms and a delicate lilting grace. Reiner�s quick tempi throughout the Allegro con fuoco make absolute sense and bring out the urgent forward driving thrust of the music. The rapid closing punctuating trombones and timpani have great intensity and a punctuating bite and again perfectly judged: too often conductors slow down in the closing passages of this score to milk pathos and applause. Reiner�s quicker tempi is the right � and the most powerful � way to end this over played � and often badly conducted - work. This is the most outstanding �New World� available. Reiner brought out the most delicate orchestral nuances of Antonin Dvorák's Carnival Overture and avoiding making the work sound brash and bashed out as is often the case with this popular show stopper. The CSO play with great virtuosity yet without ever sounding superficially flashy or showing off with excess brilliance for virtuoso�s sake: it was almost like a chamber-like interpretation such is the sensitivity and intimacy of the playing. Likewise Bedřich Smetana�s The Bartered Bride Overture is given an urgent, brisk and breezy interpretation with the translucent CSO strings producing feather light playing and Reiner conducting with the an appropriate urgent incisiveness and jaunty swagger. Jaromír Weinberger�s Polka and Fugue, from Schwanda the Bagpiper, is a grotesquely embarrassing work but � like Toscanini � Reiner is able to make a third rate score sound first rate and the CSO play it with great panache and aplomb. 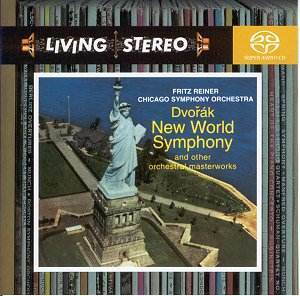 If you only had to have one version of Dvorák's �New World� Symphony I would highly recommend this superlatively played and conducted account by Reiner and the CSO. Despite by criticisms of this SACD transfer the sound is still acceptable but it is worth you trying to purchase a copy of the1995 BMG Classics issue (CD: 09026-62587-2) which is far warmer with a wider dynamic range.